Welcome to 12800 W State Rd in Grand Ledge. 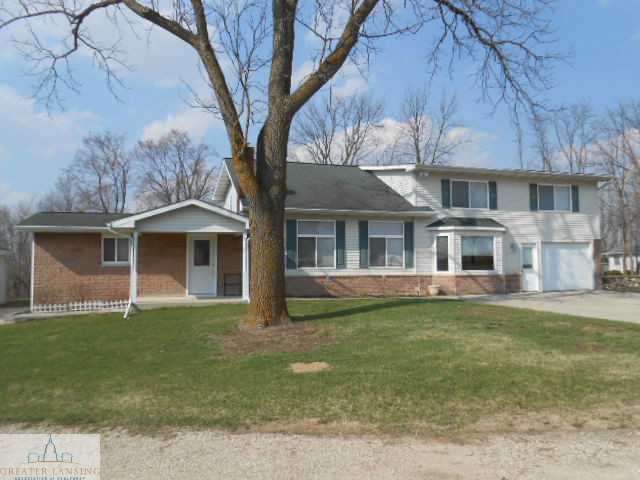 This 5 bedroom, 3.5 bathroom two-story home is situated on just over 2 acres. Upon entering take notice of the spacious living room and enormous front window that provides plenty of natural lighting. The main level also features a gargantuan kitchen and dining room area, with cabinets and counter space galore, 1.5 bathrooms, laundry room, and one bedroom. The second level features a mother in law apartment, 1bedroom and a full bathroom, with separate stair case and entrance. It can be accessed from inside the house on the 2nd floor or it can be access by a set of stairs from the first floor, 3 additional bedrooms and a full bathroom. This home has updates galore! Updates include; fresh coat of paint throughout, new garbage disposal, new motor on furnace, new septic system in 2006, new roof in 2000, new front door, and much more! This home features closets galore, an external wood burning boiler, central air, 24×20 detached garage built in 2006 features a concrete floor and door opener, 36×48 heated pole barn with side entry and 2 garage doors, one on each end. Plus 16×22 heated loft with an external wood furnace. Whole home stereo system with controls in each room makes this home ideal for entertaining. For additional information and photos on this property CLICK HERE! Posted on June 11, 2014, in Grand Ledge Listings. Bookmark the permalink. Leave a comment.